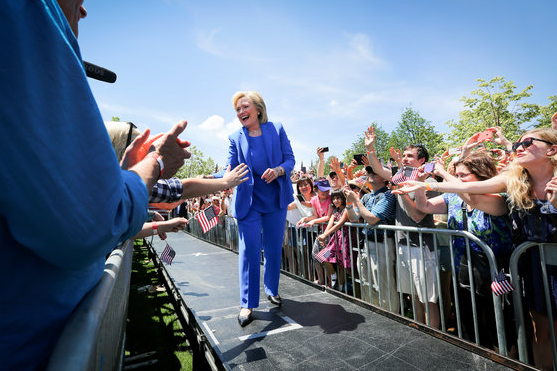 Like any candidate, Hillary Clinton needs to build rapport in order to get votes. People may agree with your policies and these will have already won-over one's political base - yet to win elections and not just primaries, candidates must capture that middle 1/3 of the electorate. And swing voters will vote for those the LIKE - and then rationalize their decisions with intellectual wallpaper. We of course believe we're doing this the other way around, but we're all human beings and that's not the way we operate. In short, to win you must possess - and project - likability. Few politicians truly understand this much past a superficial (and insincere) smile. Both Bill Clinton and Ronald Reagan knew this instinctively - however Hillary does not. We turn our whole body - eyes, head, shoulders, hips and feet - towards those we like and/or those we respect. When you're running for high political office - the crowds are huge and of course you can't begin to get to everyone. It takes much more time and effort. You'll end up greeting less people. Yet you will build more rapport - much more. And those who don't get to shake your hand and look you in the eye, will do so vicariously. You'll win their votes. This is another profound version of quality vs. quantity and sincerity vs. veneer.